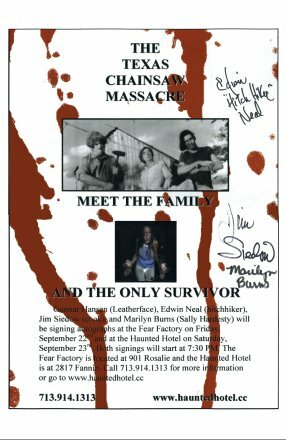 Texas Chainsaw Massacre Cast Reunion in Houston, TX. For those of you that were lucky enough to be able to come to Houston, TX for the cast reunion, I'm sure it was worth the trip. 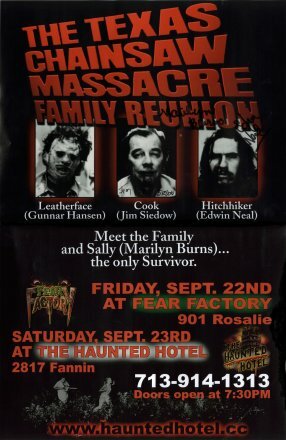 On September 22nd, they were at the Fear Factory. On the 23rd, they were at the Haunted Hotel. They signed many autographs and talked to fans, old and new. They were also impressed at the rare items that some fans brought with them to autograph. Here, I have posted my pictures from the event. But you can also view Rick Balin's pictures that his better half, Dotti took. You can find those pictures on his section of my web site in the Fan Foto section. Below are also the official and unofficial posters made for the appearances. The one on the left is the official poster they used. The one on the right is the poster they decided not to use. During the cast appearance at the Fear Factory, my wife and I had the pleasure of spending time with Jim Siedow's wife, Ruth. She is indeed one of the sweetest and smartest ladies you will ever meet. I am glad that we had that time to sit and chat with her.